«©NCSX» When shopping for towels, there's a myriad of choices in department stores across the land. You can have your taupe-colored 100% Egyptian cotton towels but we want our (cue the trumpets) 30th Anniversary Space Invaders Towels. Measuring 120cm (47.24") in length and thirsty, the cotton towels come in three varieties but we're partial to the white one decorated with menacing red invaders. If we were goaded into choosing a second one, we'd probably nab the one on the right of the product photo. 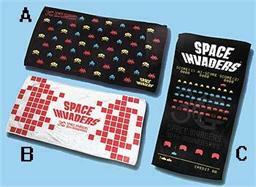 View larger photos for the Invaders towels on the main NCSX website. View the Complete NCS Toy Gallery. This document is ©NCSX 2008. All rights reserved. No reproduction in whole or in part of this document may be made without express written consent of National Console Support, Inc.
Taito loves Space Invaders. The game debuted in 1978 and the company has been minting ducats off the back of the franchise for thirty years. Space Invaders aliens are keychain friendly fodder as seen in Taito's new collection of crystal clear acrylic cube keychains. The 30th Anniversary of Space Invaders is in full swing and Taito's been celebrating the historic event with numerous product announcements and preorders.